Stand up for records access! On May 22, 2017, President Trump released more details about his proposed Fiscal Year 2018 budget. Overall there were cuts to many of the programs that genealogists regularly use. 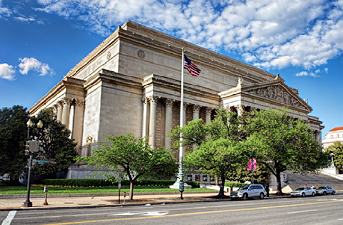 The National Archives and Records Administration (NARA) is targeted for a $16.6 million reduction in addition to the elimination of the National Historical Publications and Records Commission (NHPRC), an archival grant making arm of the National Archives which provides local and state funding in the preservation of essential historical materials making them more accessible to the public. Since 1964 NHPRC has provided grants to every state and you can view a detailed list for the last thirty years at https://www.archives.gov/nhprc/projects/states-territories. When the NARA budget is cut the hours at the Washington D.C., College Park, Maryland, and Regional Archives are usually reduced. (Note: And NARA has just announced that, as of July 22, Saturday hours are being cut at Archives I in Washington DC. Anybody who works during the week is now, officially, out of luck… — jgr) As staff cuts are made to meet the budget, our fees are often increased and the delivery time is extended for document requests. Genealogists are the largest customer base of the National Archives. If we don’t support NARA, who will? The National Archives collects data such as the number of individuals who visit a facility, what records are pulled, the number of individuals who contact the Archives to order records, etc. These numbers are matched against the number of individuals who visit the various exhibits. The reality is that the number of individuals who are visiting exhibits is increasing and the number of individuals who are conducting research at the Archives is decreasing. As a result the exhibit operations are consuming more of the Archives’ limited resources. After you write your letters, I encourage genealogist to make use of the Archives be it in Washington or a regional office. If you can’t visit then use the website and order records from the Archives. Great point, Harold — all of these repositories really are “use it or lose it” facilities. We need to vote with our feet too!